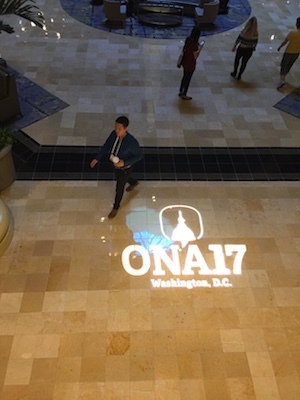 WASHINGTON, D.C. — Journalism educators, striving to be nimble as news organizations evolve, learned about immersive storytelling, social media tools, augmented reality, artificial intelligence, news bots and more at the Online News Association conference last week. Because tech has become an integral part of reporting, many journalism instructors are now pondering how programs and faculty can innovate — quickly. A study released during the conference by the International Center for Journalists found reporters generally aren’t keeping up with tech trends. This and other studies have led to a renewed effort by journalism educators to embrace and teach new tech. To be sure graduating students are qualified for emerging jobs such as social media director or community engagement editor, Mendelson and others at a meetup and brainstorming session said educators must continue to learn new things. “My answer would be to find ways to encourage everyone, all the faculty, to learn something outside their own tent,” said Sue Newhook, an assistant journalism professor at the University of King’s College in Halifax, Nova Scotia. “That can mean new skills, ideas and approaches,” she said. Getting familiar with new tech – and being comfortable enough to teach it – can seem daunting, several instructors said. But the job can be made easier if journalism educators band together, said Eric Newton, innovation chief of the Walter Cronkite School of Journalism and Mass Communication at Arizona State University. “Probably the best thing a professor can do is let go of the idea that one must master something before teaching it to someone else,” he said in an interview with MediaShift. “There are times when all the students need to know is the existence of new tools, and they can learn them themselves. And then once they’ve learned them, you have a wonderful class discussion about the best ways to use them for journalism, which is the value added that any good journalism educator can bring, even if they are not masters of those tools,” he said. Newton, a long-time champion of journalism at the Knight Foundation, said educators can get started by connecting to resources such as the ONA Educator’s Facebook page. As more resources become available, the community of educators using them, and ultimately teaching each other, grows. Professors also need to give themselves permission and time to experiment, he said. 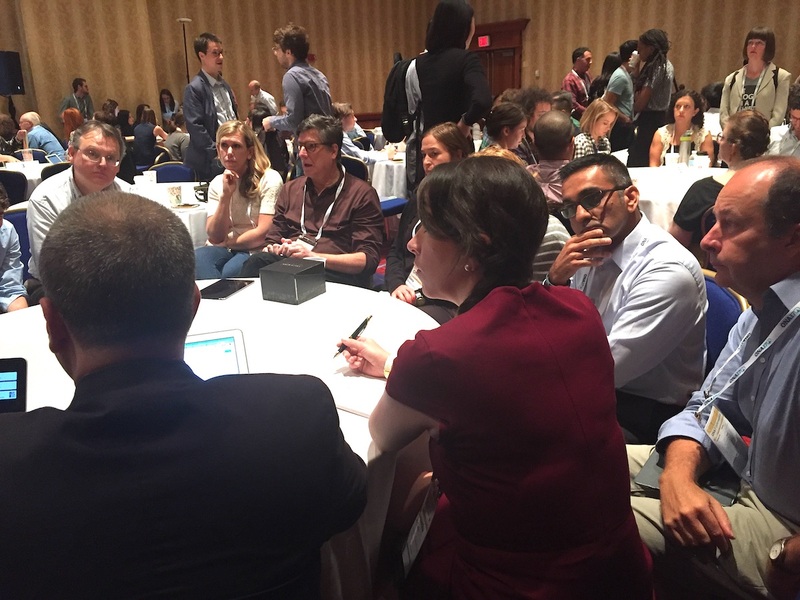 The conference, where journalists comprise a growing number of attendees, served as a spot for educators and other presenters to share resources and classroom success stories. For a while, immersive reporting (think 360-degree video or augmented reality) was not a part of the mainstream journalism landscape. Two of the people who spoke on a panel about 360 reporting are employees of two of the largest news outlets, the Associated Press and The New York Times. Both do extensive work with 360 video, which means it should be a part of j-school curricula soon. Panelist Robert Hernandez, associate professor of professional practice at the USC Annenberg School of Journalism, said journalism educators can get started with small and inexpensive spherical cameras to introduce students to this type of reporting. See more about his 360 journalism projects here. Read this for reviews of equipment. Coincidentally, Hernandez and his students won an Online Journalism Association Pro-AM student award at the conference for their story on the Salton Sea, which makes heavy use of 360 video. Much of the public conversation about news happens on social media. That means journalists need to know how to search posts across many platforms in breaking news situations, and several parts of the conference focused on tools that make this job easy. Crowdtangle, owned by and integrated with Facebook, has emerged as a powerhouse. Those with a Crowdtangle dashboard in Facebook can join the “Crowdtangler” closed group. (Others with pending requests for access to Crowdtangle need to wait.) There’s also a Facebook Instagram Workshop for News and Publishers group for tips. Crowdtangle allows users to show others the top social posts related to an event in real time. This can be handy for live TV broadcasts. Knowing some web and design skills are a must for graduating journalism students, even at print organizations. Three panelists (all educators) shared the tools and tech they use in classes aimed at getting students coding, creating news games and designing. Overall themed in #ONA17teachtech – Game design is a low barrier way to get students into coding, which will draw them to interactives. 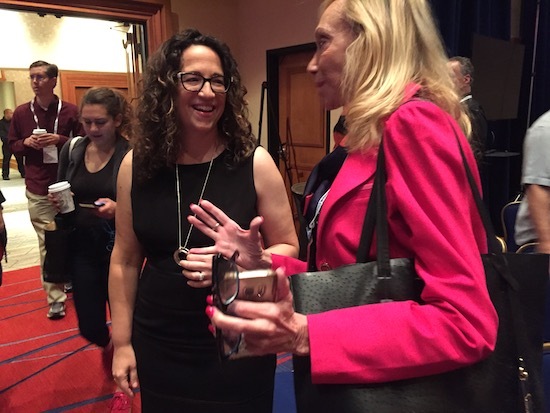 Futurist Amy Webb, who gives an annual “Tech Trends in Journalism” talk at ONA, said as everybody is talking about the tech of the future, few news organizations are taking action. One example: We’ll be getting our news from post-smartphone services like Amazon’s Alexa and other technologies without any physical user interface. This could make it complicated for readers to understand where news is coming from. Media companies that focus on technologies like artificial intelligence, however, will pull ahead. Her “trend clusters” this year relate to visual computing, voice interface and access to news. Regarding journalism education, Webb suggested grounding students in news literacy. Professors could use recent examples of sloppy and inaccurate reporting as examples to talk about “the appropriate time to send out information given that we have a proliferation of news sources…we are now news organizations that publish on the wire that is Twitter,” she told MediaShift. Read the 2018 tech trends for journalism and media and see her folders of related information including recommendations and readings for professors here. Watch the video of her talk here. During one session, journalism educators heard from Quartz’s John Keefe, who led a hands-on session in bot building. One example of news bots is the Quartz app, where users interact with an interface that resembles a text-messaging service, delivering summaries of the day’s top stories in SMS-like chat bubbles. Participants created a basic Facebook Messenger chatbot using Dexter — a free-to-use tool for simple experimentation. The step-by-step walk-through outlined in the session can be found on Keefe’s Github page. After users complete Step 1 — registering for Dexter by clicking “Make Your First Bot” on the site’s homepage — they can learn bot syntax and see publishing options. Keefe said using bots as a means of information delivery is in its early stages, but it makes sense to go where the users are. With so much new tech to teach, educators at the conference spoke of new classes to add to their programs – although many said they struggle with a glacial pace for adapting new courses. As journalism continues to dramatically change, Newton, who is updating his landmark journalism education book “Searchlights and Sunglasses,” said evolving will just become part of what educators do. “It’s not that the future is any one technology or one particular genre of technologies; the future is ever-changing technologies and the capacity to be comfortable with that,” Newton said. Kate Nash Cunningham is the social media editor for MediaShift. She teaches digital journalism at the University of New Mexico. Additional reporting by Matt Veto, professor of practice at Lehigh University.